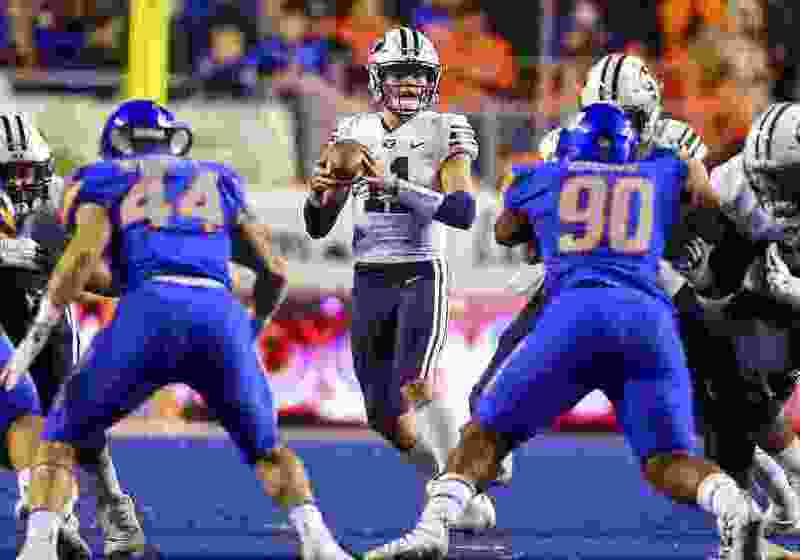 Boise, Idaho • BYU’s futility streak on the blue turf of Boise State’s Albertsons Stadium continued Saturday night, again in one of the most excruciating ways possible. The Cougars can mostly blame themselves. Once again, red-zone failures, penalties and costly turnovers plagued BYU’s offense, bone-headed mistakes tortured BYU’s special teams, and Boise State quarterback Brett Rypien and his clock-eating offense did the rest against a BYU defense that couldn’t get off the field on third down. The Broncos took a 21-16 win, improving to 5-0 all-time against BYU in games played in Boise. The Cougars (4-5) are now below .500 for the first time this season and will need to win two of the their next three games — against UMass, New Mexico State and Utah — to become bowl eligible. Boise State improved to 7-2 and now leads the all-time series with BYU, 7-2. Trailing 21-16, BYU took over on its 17-yard line with 2:05 remaining and drove to the Boise State 3. However, Zach Wilson was stopped short of the goal line on the final play of the game, and the clock ran out on BYU’s upset hopes. Making his first road start, Wilson threw for 252 yards and ran for a touchdown. But he was sacked seven times, and also mishandled a snap. Rypien threw for 214 yards and a touchdown for the Broncos, who were held to a season-low 327 yards. Boise State used a 16-play touchdown drive that took more than eight minutes off the clock in the third quarter to take control and a 21-13 lead, then survived a wild play to keep BYU out of the end zone late in that quarter. BYU looked poised to cut into the lead, perhaps pull into a tie, but the craziest play of the season thwarted the opportunity. Neil Pau’u, a former high school quarterback, took a lateral from Wilson and threw a 35-yard pass to Matt Bushman, who caught in one-handed. However, BSU’s Tyler Horton forced Bushman to fumble — Mountain West Conference replay officials let stand the ruling on the field — just before the BYU tight end hit the ground and Horton recovered it in the end zone. The Cougars got the ball back and drove to the Broncos’ 26, but a sack and a false start penalty killed that drive, and Skyler Southam’s 41-yard field goal cut BSU’s lead to 21-16. The Cougars forced Boise State’s third punt, but came up just short, and Boise State players rushed the field to celebrate their final stop. From the time Riley Burt decided to bring the opening kickoff out of the end zone, the Cougars struggled with mistakes. A 28-yard punt followed Burt’s blunder, and Boise State’s first possession started at the BYU 41-yard line. Seven plays later, the Broncos were in the end zone, thanks to a 1-yard touchdown run by Alexander Mattison. The Cougars moved the ball well on their second series, but Southam’s 48-yard field goal attempt fell way short. Boise State put together an 11-play, 69-yard drive to take a 14-0 lead at the end of the first quarter, and the Cougars were reeling. It got worse when Sione Finau fumbled the ensuing kickoff and BSU’s Skyler Seibold recovered at the BYU 18. However, a holding call set the Broncos back a bit, and Haden Hoggarth missed a 41-yard field goal. BYU drove deep into BSU territory at the start of the second quarter and had a first-and-goal at the 9. But Jaren Hall, making his first appearance of the season, lost 2 yards out of the Wildcat formation and a corner fade pass to Talon Shumway wasn’t close to being completed. Southam’s 26-yard field goal put the Cougars on the board. BYU cornerback Michael Shelton, who had been beaten on BSU’s second touchdown, intercepted Rypien and returned the ball to the Boise State 19 on the Broncos following possession. However, the Cougars sputtered in the red zone again after a first-and-goal at the 5, Wilson getting sacked on subsequent plays, and they had to settle for another field goal. Southam’s 43-yarder cut BSU’s lead to 14-6. After John Hightower’s 100-yard kickoff return was nullified by a block-in-the-back penalty, the Broncos had to punt and the Cougars drove into the red zone again just before halftime. Again, the Cougars faltered. A holding penalty on Brady Christensen backed them up after they reached the 13, and Wilson fumbled a slightly high snap that Boise State recovered to end the threat. Wilson was sacked four times in the first half. He completed 12 of 17 passes for 126 yards. Rypien was 13 of 18 for 136 yards and a touchdown in the first half. it was BSU’s turn to make a mistake the first series of the second half. The Broncos were driving, but fumbled at the BYU 32 and reserve linebacker Rhett Sandlin recovered. The Cougars drove 68 yards and scored on a 4-yard touchdown run by Wilson to trim Boise State’s lead to 14-13.